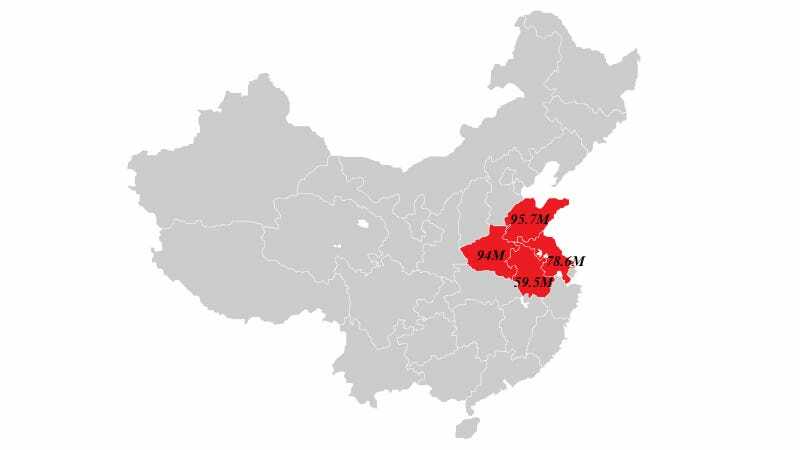 The Entire U.S. Population Fits In These 4 Chinese Provinces. So What? In terms of total land area, the U.S. and China are close in size, but the latter's population is more than four times that of the United States. This map shows how the U.S. population fits into four of China's most populous provinces. Taken on its own, however, the map provides a skewed depiction of China's population density. The upshot is that neither of these two maps of China is representative of the country as a whole. In fact, as a commenter named Buckfost mentions, the charts are "unrepresentative at opposite ends of the scale." The first map "suggests the US population would fit 1.5 times into China," while the second "suggests about 15 times. In reality it fits in 4.3 times." Why does any of this matter? Because websites love to take maps like these and tell you that they'll CHANGE THE WAY YOU SEE THE WORLD, but what about the way you see the world is being changed by these maps, really? Comparisons like these are almost almost meaningless in the absence of some additional context. If you're going to "ooh" and "ahh" over a map that "defies your expectations of the way the world works," take the time to consider it critically. Whydoes it contradict with your view of the world? What story does a country's population distribution (or a planet's, for that matter) really tell us? Is it really so surprising that China's uninhabited areas would encompass its most barren regions, from the extreme altitude environs of northern Tibet, to the sandy wastes of central Tarim? What does this map tell us about China's rapidly expanding floating population ("floating," here, referring to migrant populations that reside in a given destination county a minimum of six months, without local household registration status), which has exploded from less than 10-million to over 200-million people in the span of just three decades? To what extent do human events shape our distribution across the globe, and to what extent is it nature's hand that guides us? If you think about these things, and discuss them with other people, you'll find that the answers are not always obvious, and rarely come easily. Be wary of "obvious" answers – e.g., the center of Australia may be barren and sparsely populated, but the distribution of people along its coasts is surprisingly understudied, and not always clearly understood. "Population is too often portrayed as a more or less static backdrop against which social, economic, environmental and political forces are played out," writes professor Graeme Hugo, Professor of Geography and Director of the Australian Population and Migration Research Centre at the University of Adelaide. The reality, of course, is that population is an aggressively dynamic entity that moves, shrinks, grows, and mutates in manners complex and organismal.